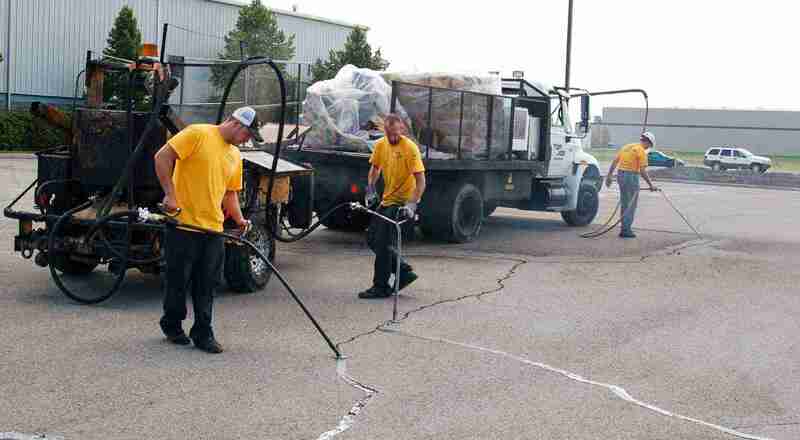 Crack sealing is the most important maintenance step for your asphalt. If money is tight and you have to prioritize, SEAL CRACKS! Absolutely nothing will ruin asphalt faster than large amounts of water running down cracks and underneath the pavement, eroding the base and subgrade. This destroys the load bearing capacity of the pavement, causing fatigue cracks, sinkholes, and potholes. ack on tires and shoes. To hard, and the sealant will not be able to expand when the weather gets cold, causing it to fail. The best approach is to go with the softest material possible based on traffic patterns and local climate and season. Top Job estimators know how to choose the best sealant for your job. Cutting edge, top-of-the-line equipment insures the highest quality, fast. This means, the material will go down faster and dry earlier, allowing properties to be reopened to traffic sooner. This translates into less impact on customers, tenants, deliveries and employee access, saving you time and money.